This issue's story doesn't waste time with the talking and is packed with plenty of action. We get a slight glimpse into the personal life of Major Bludd and see just how incredibly different it is from his life as a Cobra. Costa does well in portraying just how dangerous Bludd is, and explaining who he's in league with and controls. At this point, I really have no clue as to who will end up being Cobra Commander, when the dust is settles. Artists Antonio Fuso and Chee split art duties in this issue. Admittedly, I've never seen Chee's work, but it's really nice and fits the style of the series. 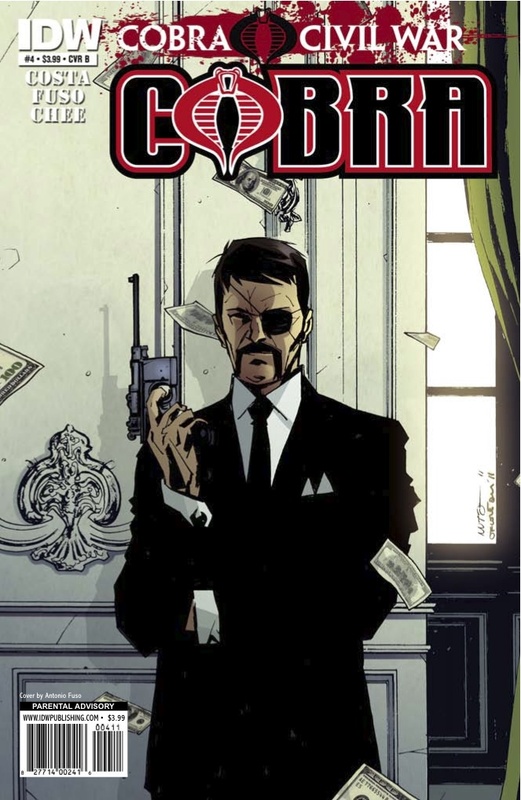 Overall, this issue really picks up the pace of the whole Cobra Civil War story and gets you excited for what's coming next. My recommendation--buy it!